I will admit this up-front: I want my garden to be great. Not just okay, but great. But here’s the problem: I don’t want to work hard. Here’s how I trick my chickens into growing my garden. Yes, I’m a lazy gardener. Thankfully, chickens are NOT lazy. 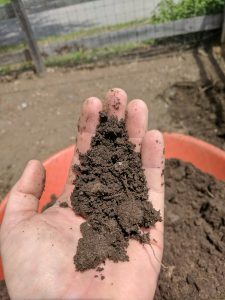 They love to forage, and that can help make wonderful garden compost that you can use to grow a truly great garden. Combining chickens and gardening is itself actually pretty fun! You can also trick your chickens into doing your yardwork. 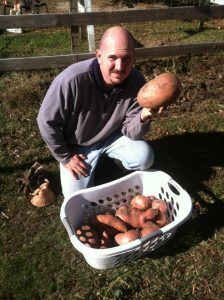 Below, you will find my secret to growing one of my favorite foods—sweet potatoes—and how I use my chickens and my local eco-loop (the circle of organic resources around me) to get those delicious, healthy tubers. The first ingredient is LEAVES. Yes, leaves. My town gives truckloads of leaves to residents that ask for them. So every year I have a huge delivery or two left in my side-yard. Perhaps you have your own leaves you can rake up in the fall. You can even volunteer to rake up your neighbor’s leaves, too. They’ll LOVE you for it! However you get them, fall leaves can be a good way to infuse organic material into your garden if you do it right! But please bear a few things in mind if you want to toss fall leaves in to your chickens: leaves are not bedding. They are not absorbent, so do a bit at a time to avoid having the leaves turn into a rotting mess. 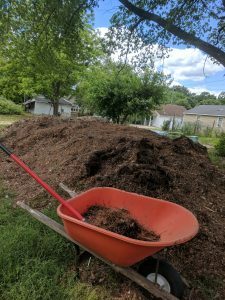 And if your run is grassy and you want to maintain the grass, adding a huge pile of leaves on top is likely to interfere. A huge pile of free leaves provided by my town. Move some leaves into your chicken run. As you can see, it doesn’t take long for the birds to scratch through the leaves and find any bugs or seeds. In the process, they break the leaves down. They also add nitrogen by pooping on it. Finally, they stir up the leaves with the dirt in the run, creating wonderful garden soil. Move the chicken-generated soil to your new growing beds. When I see that the leaves are broken down enough to be used in the garden, I take as much as I need out of the run, and spread it over my new growing beds. 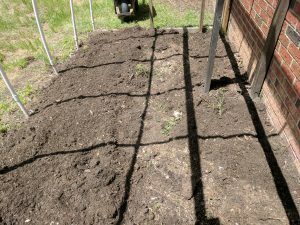 Chicken-generated garden soil delivered to a new sweet potato growing bed. Now that you’ve got your growing bed prepped with amazing, chicken-generated garden soil, you’re ready to start growing your favorite veggies. Here are my tips for how you can grow sweet potatoes in this soil. First, start with your harvest of sweet potatoes from last year. The picture below shows one of the sweet potatoes that I harvested early last November. 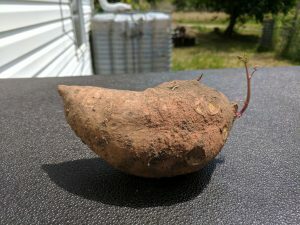 My family and I ate the smaller tubers, but saved the larger ones like this one to let them sprout and begin to grow what’s called a “slip.” A slip is a sprout that comes from the sweet potato. I store my sweet potato tubers all winter, and they usually start to grow slips in March. A sweet potato with a new slip growing out the right side. Once the slips are about 4 inches long, I break them off the potato from the base of the slip and put them in water to begin to grow roots. 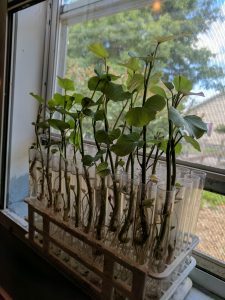 I use test tubes for my rooting slips, but any container or small vase with water would likely work. Set your rooting slips in a nice window sill so they can get some sun to help them grow leaves as well as roots. Several sweet potato slips getting ready to go in the garden! I live in USDA Zone 7b in North Carolina. 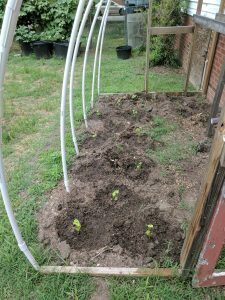 That means I plant my sweet potato slips around mid-May, when the ground is sufficiently warm and there is no chance of frost. When you plant your slips will be determined by your local USDA hardiness zone and your climate. To get those really large sweet potatoes, they’ll need a good 3 to 5 month growing season without danger of frost. Plant them in full sun, the more sun the better. You’ll want to water your new slips in really well for the first few days. They may look a little droopy at first, but have no fear! They’ll perk up and begin growing like crazy within just a few weeks. Sweet potatoes are a vine plant, so be ready to give them some room to spread. 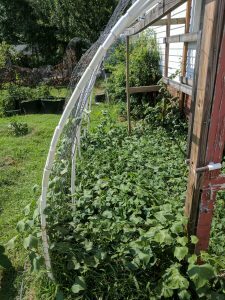 If you don’t have the space, you can set up trellising to help them grow vertically. SUPER GARDENER HINT: Don’t let the long vines that grow from the slips stay on the ground in one place too long. Wherever they touch the ground, they’ll attempt to root again and form a new plant. 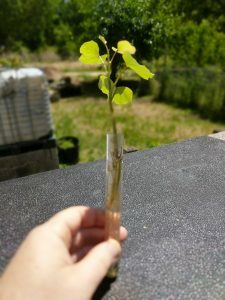 If they are allowed to do that, the new plant will take nutrients and growth away from the main slip and will produce more small tubers instead of the larger, big tubers you’ll want to be able to cook with. About once a week, when it’s time to cut the grass, I go around my sweet potato bed and lift any vines that were on the ground to get them out of the way. In so doing, I remove any vine roots that have formed and redirect all the plant’s energy to the main plant. That way I get the biggest sweet potatoes possible for my garden! Just before our first frost in October or November (or just after the frost if I’m late), it’s time to dig through the sweet potato bed and find the treasure—big, wonderful, delicious, healthy sweet potatoes! Your kids will even enjoy this treasure hunt, so feel free to get them involved. The one who finds the biggest tuber wins! Sweet potatoes the same size and shape as my head! 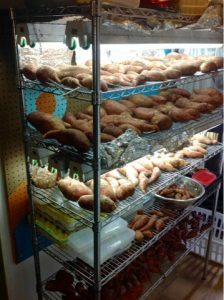 I store sweet potatoes on my seed station and eat them regularly throughout the winter. Don’t forget to save some of the best ones to let them sprout slips to use for next year’s harvest. If you do that, you’ll never have to buy sweet potato slips again! That’s how leaves and chickens combine to produce a bountiful harvest of sweet potatoes. You can use these tips to grow all kinds of veggies in your own garden. Your chickens, your stomach, and Mother Earth will thank you!